Today is my blogiversary. Four years ago, I started this food blog with a post about Julie Powell's book Julie & Julia. My first posted recipe was Julia Child's potato & leek soup. Since then I've written about nearly 400 new recipes that I've tried for the first time. Over the past four years, my life has gone through many changes. There have been many, many happy moments but also lots of heartbreaking drama and a couple really scary events. Through it all, though, I've continued to cook at home, try new recipes & ingredients & techniques, and write about it here. This blog continues to be my therapy, my creative outlet. As a result of blogging, I've met some fabulous people, several of whom have become great friends. I've also had some awesome experiences because of blogging...flying to LA to meet Julie Powell, working at Kitchen Conservatory, being "chef for a day" with Josh Galliano at Monarch, & writing for Sauce Magazine. It may sound cliche but blogging has changed my life. Not that I've become rich & famous or anything by any means...but this little blog of mine gave my life some kind of purpose at a time when I felt like I didn't have any. This blog has also given me an excuse to spend four hours on a Sunday afternoon making the most delicious ribs I've ever eaten. I gave Jerad a copy of Thomas Keller's Ad Hoc at Home cookbook for our first wedding anniversary last month. Initially, he said that he was going to cook all of the recipes in it. And then, he started reading through the book. "These recipes aren't really hard," he proclaimed, "but you have to make a bunch of things before you can make the thing you want to make." He's right. The Ad Hoc recipes aren't necessarily difficult, but they are complicated & time-consuming. So, we picked the slow-grilled spareribs for our inaugural recipe. They were good...I mean really good...like, I-need-some-time-alone-with-this-pork good. They were down-right orgasmic. Combine all the rub ingredients in a medium bowl. If your grill is small, sear the meat in batches. Place the ribs meat side down, without crowding, on the hot section of the grill and cook for about 2 minutes, until grill marks appear. 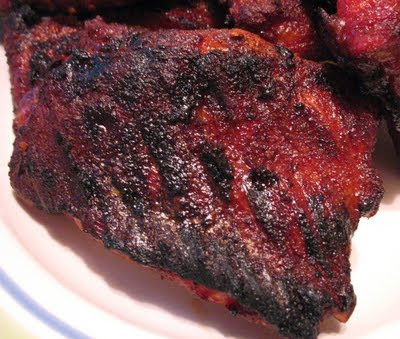 Turn the ribs 90 degrees to create a crosshatch pattern and cook for another 2 minutes, or until well marked. Transfer the ribs, meat side up, to the cool section of the grill, close the lid, and cook until tender but not falling off the bones, about 2 hours; move the ribs around after the first hour so they cook evenly. The temperature of the grill should remain at about 250 degrees F; if the grill doesn't have a thermometer, put an oven thermometer next to the meat to check the temperature, and adjust the heat as necessary. 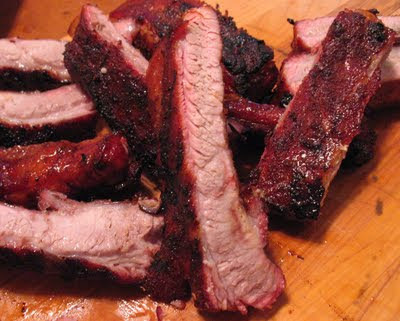 Cut the spareribs into individual ribs if desired to serve. * We moved the hot coals to one side of the grill & slow-cooked the ribs on the opposite. I'm gonna have to make those. So proud that Jerad actually made them! I knew the little guy could do it! Happy blogiversary! I feel the same way about my blog and the experiences I've had because of it. These look amazing - I love ribs! I can't imagine having a blog for four years, congrats!